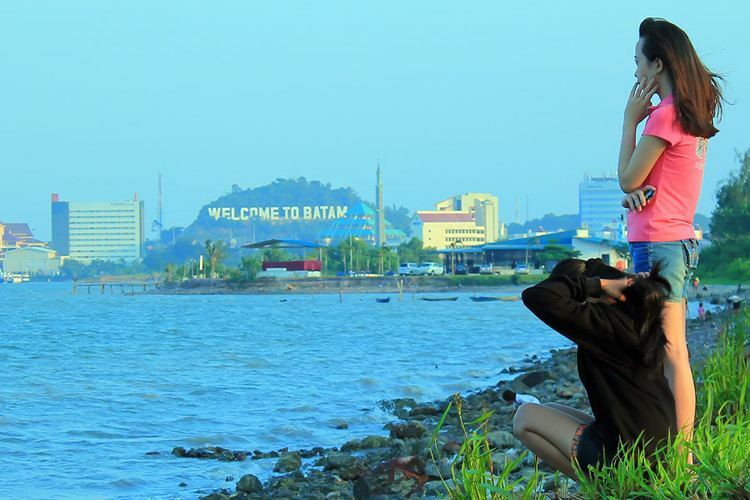 Batam is the largest city (kota) of Riau Islands Province of Indonesia as well the name of an island. The city of Batam administrative area covers of several islands: Batam Island is the core urban and industrial zone. Both Galang Island and Rempang Island are connected to Batam Island by short bridges, the 3 islands are collectively called Barelang. These latter two islands maintain their rural character, as does nearby Bulan Island, also administered as part of the municipality (kota). Batam is an industrial boomtown, an emerging transport hub, and part of a free trade zone the Indonesia–Malaysia–Singapore Growth Triangle, located 20 km (12 mi) off Singapore's south coast. 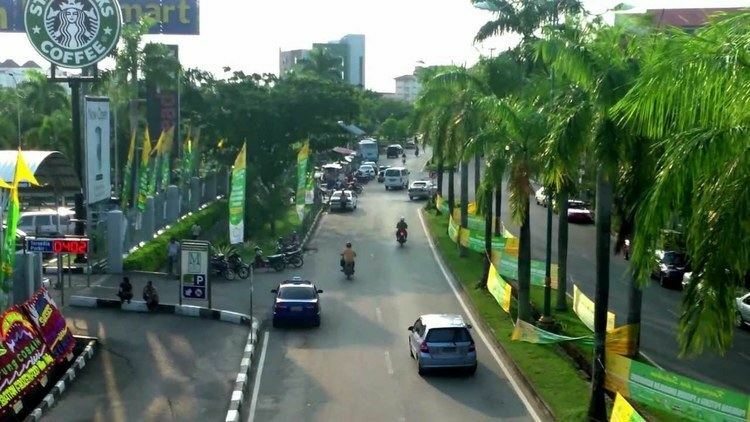 The Batam municipality has a population of 1.164.352 in the 2015 intercensal survey. It is the closest part of Indonesia to Singapore, at a minimum land distance of 5.8 km. During the 2010 national Census, Batam was the fastest-growing municipality in Indonesia the decade prior, with a population growth rate of 11% per year. In 2017 it has been reported the island suffered from severe job losses, some 300,000 workers have been laid off. Batam is a roughly oval island with many bays, islets, and peninsulas, located west of Bintan Island, south of Singapore, north of Rempang and Galang, and east of Bulan Island. The Riau Strait separates Batam and Bintan. Batam Municipality covers 3,990 km2, of which 1,040km2 is land, a figure which includes some land reclamation. However, Barelang Island (not actually one but three, see above) covers roughly 715 km2 of that 1,040 km2, and Batam island itself covers only about 410 km2 out of the total. The bulk of the Municipal population resides on Batam island. Long before it became a boomtown, Batam was backwater of the Riau Archipelago, part of the Johor Sultanate, which came to hold sway in the 1500s, much like its neighbor Singapore. Fishing, maritime trade and piracy were main activities, and the local language and culture was Riau Malay. Today, Batam is inhabited by a heterogeneous mixture of people due to labor migration and desire to be close to Singapore; it is very diverse, some 2/3 of the total are migrants. The predominant ethnicities are Javanese, Malays, Batak, Minangkabau, and Chinese. As a municipality it exemplifies the national motto of "Bhinneka Tunggal Ika" (Unity in Diversity). The location of Batam close to Singapore is conducive to the development of economic, sociopolitical, and cultural aspects of the local community. In April 2012, Batam had a population of 1,153,860 inhabitants. The population is increasing rapidly, with a population growth rate of more than 8% per year between 2001 and 2012. Islam is the majority religion in Batam, with 76.69% of the population, followed by Christians (17.02%), Buddhists (5.79%), and Hinduism (0.4%). Most of those who follow Islam are Javanese, Malays and Minangkabaus. The Great Mosque of Batam, located in the city center adjacent to the main square, the mayor's office and the provincial Parliament, is an important symbol of Islamic religious life in Batam. Christianity and Catholicism are also widely embraced by people of Batam, especially those from the Batak people of Sumatra and transmigrants from Flores also from East Indonesia. The majority of the Chinese population practises Buddhism. A number of Viharas are located in Batam, of which Vihara Duta Maiteriya is one of the most frequented, and is the largest Vihara in Southeast Asia with an area of 4.5 hectares. Indonesian is the common lingua franca of Batam in daily use. Malay, Minangkabau, Batak, Javanese, and Chinese ethnic dialects like Hokkien and Teochew are also used, and English and German is also spoken, especially by expats living in Batam. The local governmental offices are in Batam Centre. The largest community and a major commercial hub on the island is Lubuk Baja (formerly known as Nagoya). Other residential areas include Baloi Garden, Sekupang, Nongsapura (Nongsa), Waterfront City (Teluk Senimba), Batu Ampar, and Jodoh. Based on Presidential Decree No. 41/1973, the Batam Industrial Development Authority (BP Batam) was established to manage 415 kilometer square industrial complex in Batam City for heavy industry. Previously only Pertamina, Indonesia state oil company settled there with only 6,000 inhabitants. Shipbuilding and electronics manufacturing are important industries on the island. Being located close to the ports of Singapore, the speed of goods shipping and product distribution is increased, benefiting the island's economy. With lower labour costs and special government incentives, it is the site of many factories operated by foreign companies. Tourism forms a large part of the economy, with over 1.5 million tourists visiting the city in 2015. Batam is the third busiest entry port to Indonesia next to Bali and Jakarta. In 2014, around 58.8% of foreign tourists came from Singapore, 12.8% from Malaysia and 4.2% from South Korea. The local ferry terminal ports connect to nearby Singapore and Bintan, and provides routes to Johor Bahru (Malaysia). Five ferry terminals are on the island: Harbourbay, Nongsapura Ferry Terminal, Sekupang, Waterfront City, and Batam Centre International Ferry Terminal. The most recent incident happened on 29 November 2015 when a ferry 'Sea Prince' hit floating object(s) while en route to Singapore from Batam and began leaking. A total of 97 passengers were rescued on life rafts. Trans Batam is the most reliable and the cheapest public transportation in Batam. Its operation began on 2005. Trans Batam is the second BRT system in Indonesia, after Jakarta's TransJakarta. The price for one ride is Rp. 2.000,- for students and Rp. 4.000,- for public. Trans Batam begins its trip from 05:30 to 19:00. Taxies in Batam are almost available anywhere, at ferry terminals, airport, shopping malls, hotels, etc. More than 3000 taxies are in Batam. In the early 2000s, Batam commonly had Toyota Corolla taxies. Starting in late 2013, more than 95% of taxies are brand new using the Toyota Limo and Chevrolet Lova. Hang Nadim International Airport is the island's main airport, and has the longest runway of all airports in Indonesia. The airport was the largest airport in the Sumatra region from 1995–2012 with a capacity of 6 million passengers per year, and is now the second largest in the Sumatra region after Kuala Namu International Airport in Medan with a capacity of 8 million passengers. The airport has 4 pairs of jetbridges and 2 single jetbridges. Hang Nadim International Airport is the hub for Lion Air, Batik Air, Citilink, and Malindo Air. BP Batam, which operates Hang Nadim International Airport will build a new terminal with a capacity of 8 million passengers per year for each terminal (16 million passengers per year in total for two terminals) in late 2016. BP Batam targets to build 8 pairs of jetbridges in the new terminal. Domestic destinations include Pekanbaru, Palembang, Medan, Jakarta, Padang, Surabaya, Bandung, Bandar Lampung, Balikpapan, Yogyakarta, Makassar, and many more. International flights currently include Kuala Lumpur, Malaysia (operated by Malindo Air). Due to piling works for tourism activity, sand mining, and logging for charcoal business, only 4.2% of Batam island is covered in mangrove forest, a great decrease from 24% in 1970. Originally, Batam Island had 41,500 hectares of mangrove forests.